She spun in her chair, pricking her finger and almost dropping the embroidery she was working on. On the surface, Cornelia Conti was the epitome of the middle-aged faded mouse kind of woman. She favoured clothing of excellent quality, perfect taste, and understated colours and style. Her skin was sallow, her hands nicely kept and her face unremarkable. The only thing that stood out about Cornelia was her hair, which was short and a natural pepper-and-salt grey. The fact that this took a lot of effort to achieve in the year 2273 gave about the only clue that Cornelia wasn’t what she seemed. She had the underlying stubbornness of a vinegar fly in search of over-ripe banana skins. Cornelia liked to keep up her façade though, aside from her hair, because she found being overlooked, underestimated and unremembered useful. It let her get on with life, obligated only to her cat and to her peppercorn-paying job of standing one watch in four for Outward-Bound. While she stood the uneventful watches, she liked to work at embroidery. It was the fashion this year to work handcraft, presumably in retro-resistance to the loss of so much talent to the stars. Cornelia took a perverse pride in the tiny imperfections of her design. It was unique. So were many of the items available but this was unique to her. Cornelia was busily embroidering when a distress call interrupted her. It put her into crisis mode, which didn’t suit her at all. In fact, her wary mind did its best to drag her back into her comfort zone. She felt she had aged twenty years since arriving at the office for her shift, and her hands were unsteady as she picked up her embroidery and set a stitch. 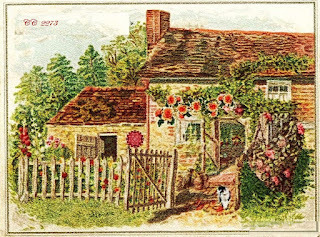 The neat scene of a cottage with roses nodding from a trellis suddenly seemed bland and twee, and Cornelia laid it aside. Blinking, Cornelia bent to lift her bag from the shelf beside her, and she pulled out a piece of fine cloth. She discarded the rose-trellised cottage and put the fresh cloth in the stretcher. Using a black-light pencil, she began to sketch out a fresh design. But oh, what was she doing? She must initiate contact with Eduard Balm and tell him rescue was on its way. That is, to date, the last we see of Cornelia’s fashionable embroidery, but as she will reappear in a later book, it probably will as well.